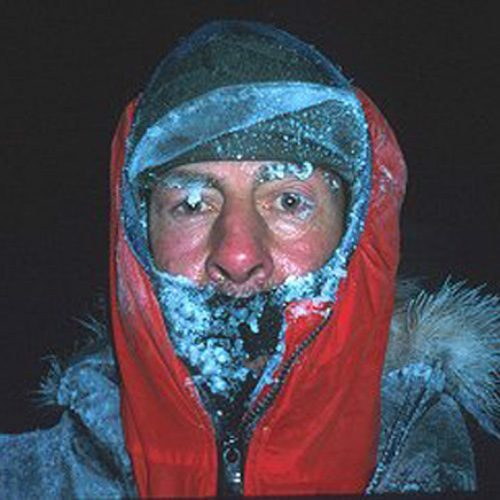 Sir Ranulph Fiennes attempt to reach the North Pole solo and unsupported. 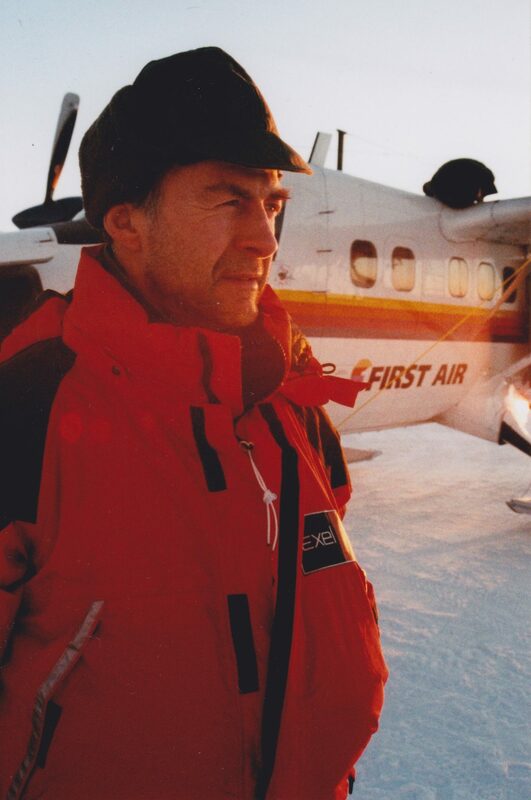 The expedition would take Ran from Ward Hunt Island on the edge of Canada, out onto the frozen sea-ice of the Arctic Ocean and across 478 miles of the harshest environments on earth. The floating ice he would be travelling over, crumbling and piling up into long rubble ridges as high as houses, or splitting apart to produce icy lakes that had to be negotiated, whilst all the time the area was roamed by Polar bears. This more difficult route that is against the natural flow of ice coming away from the North Pole had never been achieved before. 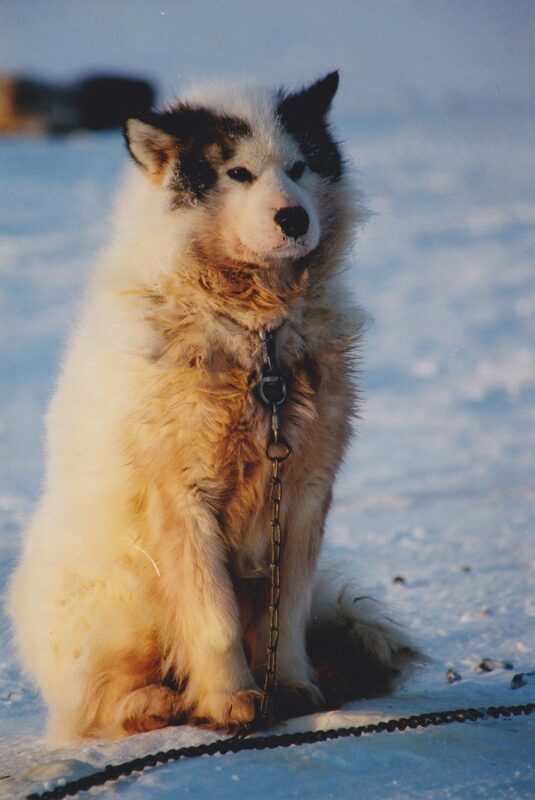 Not only would he be traversing over a vast treadmill that was always pushing him back to the start, he would do so without support or resupply, pulling all of his own food and equipment in 2 sledges totalling a massive weight of 500lbs. 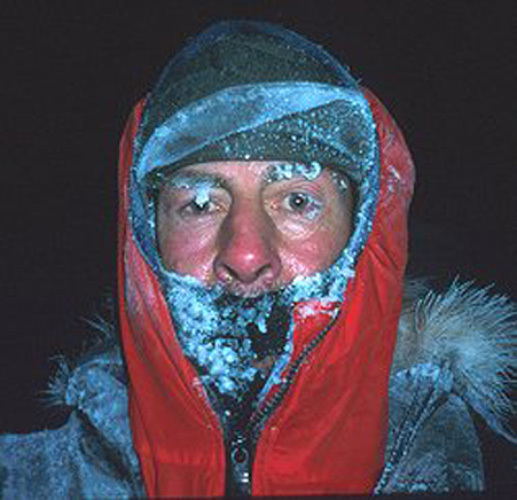 This journey was one of the last great Polar expeditions to be conquered and with the stakes stacked high, Ran could only select the best team to work with him. Mac, from Max Adventure, was selected to be his right hand man and took over most of the organisation. 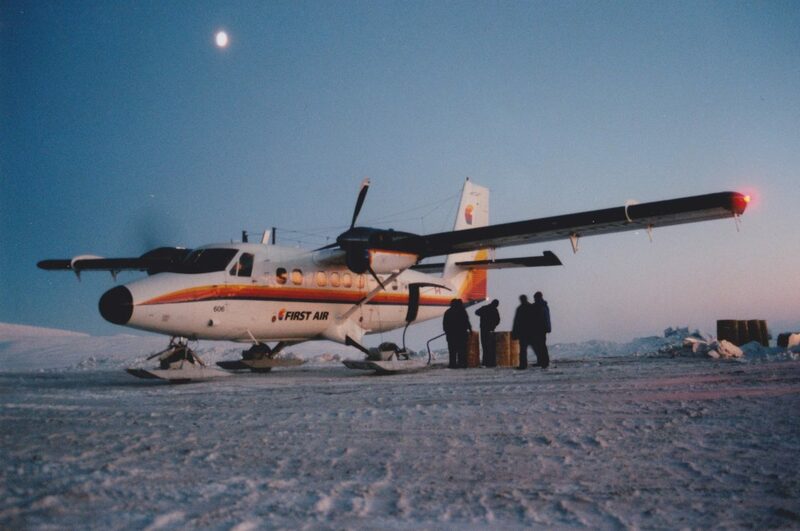 Ran and Mac arrived at Resolute Bay in northern Canada on 5th February 2000, not long after the sun had reappeared there for the first time in 5 months. 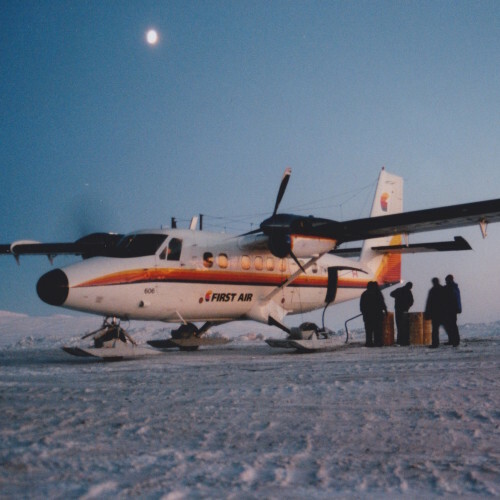 They were met in driving snow at -42°C by the Base Manager for First Air, the airline which would fly them north in a week’s time. 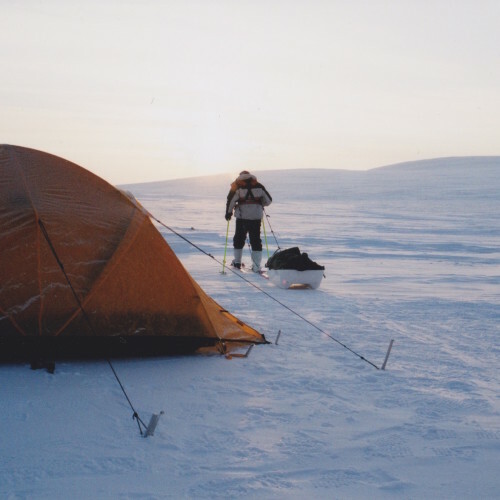 At 55, Ran could not hope to reach the Pole in less than 50 days, the period that his Norwegian competitors were aiming for. 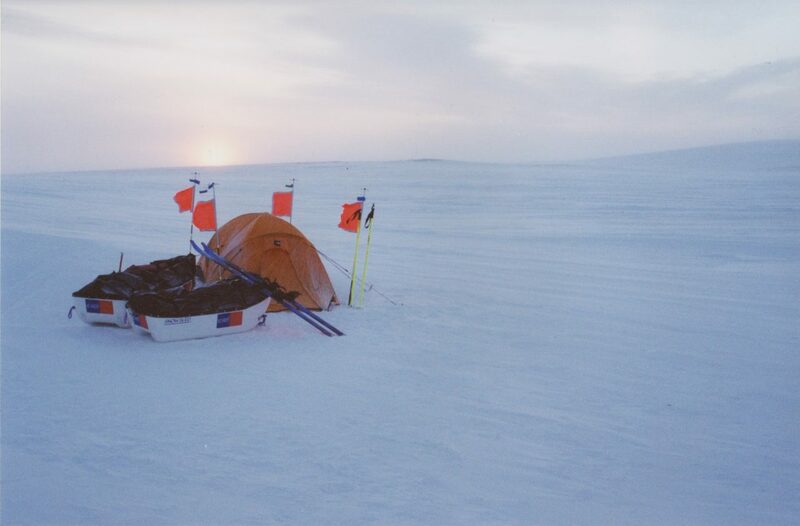 He estimated it would take him 85 days to cover the 700 miles, so the only option was to set our much earlier, long before the Arctic sun would rise. For this length of time on the ice though, his food alone would weigh more than 230lb, with fuel to melt ice coming to another 60lb. All additional gear would total another 220lb. Too much for a single sledge travelling in Arctic rubble ice, so he had to use two sledges. Altogether, Ran would need to haul 510lb and relay two loads, which meant every mile gained to the north would involve three travelled on the ground. This added to the dangers of a one-sledge trip, in that blizzards and whiteouts are common. 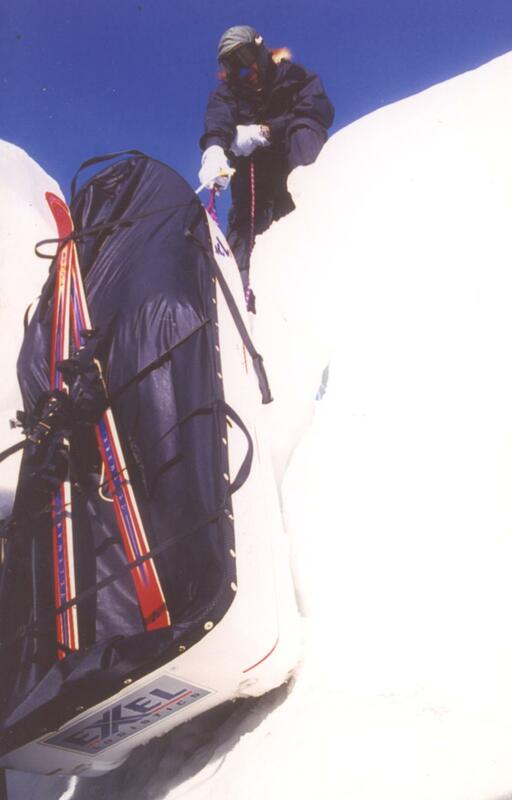 In such conditions the need to relay sledges is potentially lethal – once you have parked the first sledge and set off for your second load, you may never find it. You will then die from the cold. He had no option though but to take two sledges. 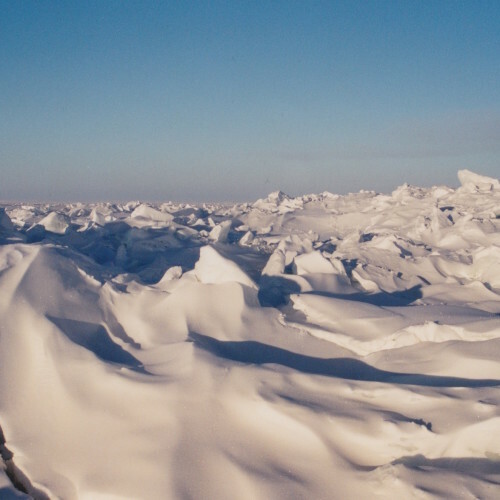 Many unsupported treks to the Pole have been scuppered by stretches of open water blocking the way north without temperatures low enough to refreeze the sea water. 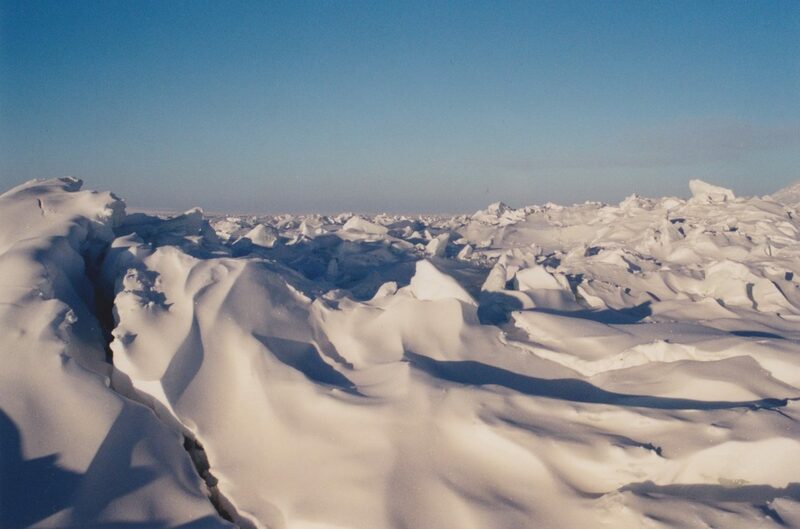 The Arctic Ocean is never more than 75% solid ice, even in the depths of winter. To avoid such delays Ran had two buoyancy tubes, designed by Snowsled and Max Adventure, that fastened to either side of his bigger sledge making it buoyant even when fully laden and with me sitting atop its load wielding a paddle. 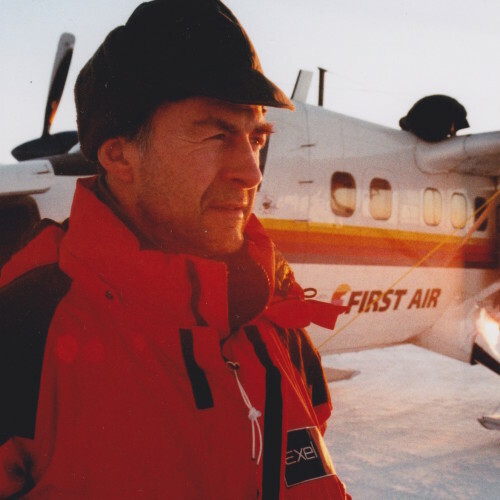 On 14th February Ran and Mac flew to the most northerly point of Canada, Ward Hunt Island at the edge of the Arctic Ocean, the starting point of most North Pole attempts. With lurching bumps, they were down. As the door opened, they felt the bitter cold of 84° North in winter. The sun would not show its face there for three more weeks and then only for 30 minutes a day. Meanwhile, Ran would travel by moonlight and head torch. Once the ski-plane had gone, Ran used his compass to take a bearing to geographical north. The weather was clear and the sea ice quiet to the north, a sign that the ice was not on the move. Day 1 went well, but on waking, the moon had vanished behind the hills, meaning Ran would not be able to differentiate clearly between solid ice and thinly skinned zones. 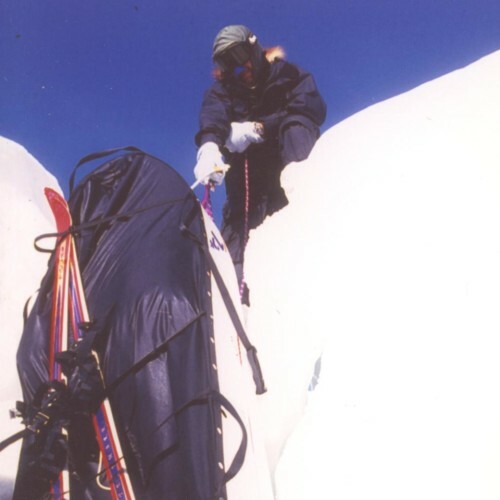 Arriving at a wall of slabs 15 feet high, Ran hauled the 300lb sledge to the top. Too late, he heard a movement as the sledge fell down the other side, 15 feet onto sharp ice blocks. A 16 inch tear had ripped through the bow, and the floatability of the sledge’s hull, designed to be completely watertight, was compromised. There was no alternative but to head back to the abandoned huts on Ward Hunt Island. There Ran hoped to find suitable materials to effect a repair. 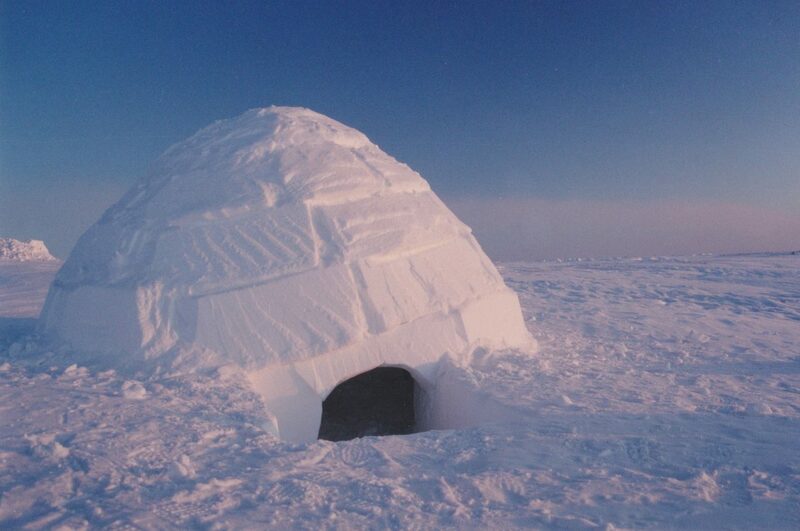 He skied for 2 hours and after an hour spent digging out the door, gained entry. The temperature outside had fallen to -49°C with a bitter breeze. Using materials he found Ran effected a repair and a few hours later he was back at the ice edge, happy that his work had made the sledge watertight. 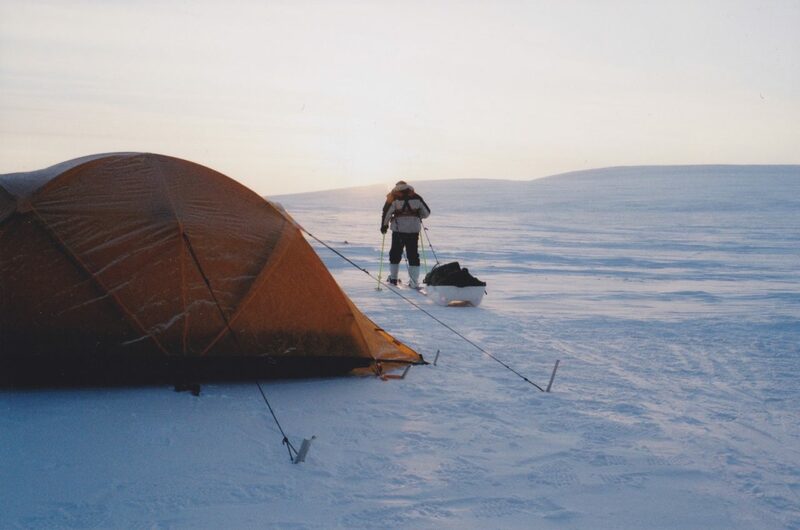 Ran camped on the thin ice but woke to hear all manner of noises: cracking and rumbling. A nearby and frightening roar galvanised him into movement from the depths of his four-layer sleeping bag. Fearful of imminent upheaval due to the tidal influence of the full Moon fracturing the ice, Ran pressed on northwards. He had been travelling for well over 10 hours and was making good progress, but was beginning to tire so decided to camp on a surface that looked solid. The Moon had vanished, but whenever he stopped he heard the grumble of ice on the move. He had the small sledge with him and the big one 500 yards to the south. As he clambered over a slab, suddenly and without warning it tilted under the sledge, unbalancing him and pulling him backwards. The noise that followed was the one you most hate to hear in the Arctic, a splash as the sledge fell into the sea. It was under water, but not sinking. He hauled on the ropes, but they were jammed somewhere under the slabs. 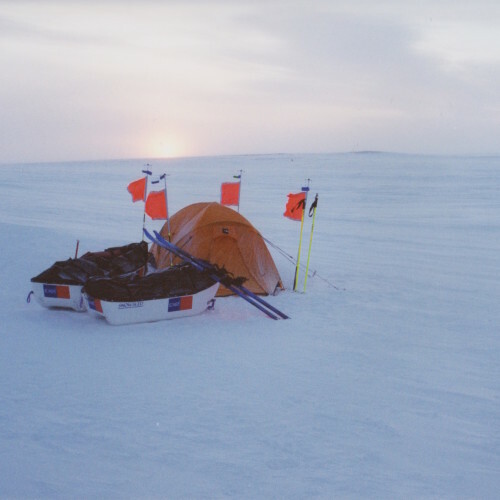 70 days worth of food and 30 of fuel were on that sledge – and the communication gear; without it the expedition was over. The ice was moving – he had to save the sledge quickly. He pulled hard and the sodden sledge rose to the surface. His left hand was numb, but I couldn’t replace his mitt until the sledge was out of the sea. Minutes later the sledge was on ‘dry land’. Both his mitts were back on and he tried to revive his cold hands but without success. He took off the mitt and felt the dead left hand. The fingers were ramrod stiff and ivory white. Ran knew that if he let his good hand go even partially numb, he would be unable to erect the tent and start the cooker, which he needed to do quickly for he was shivering in his thin hauling-clothes. He returned to the big sledge. The next 30 minutes were a nightmare. The sledge-cover zip jammed; he struggled to start the cooker and when it did finally light he almost set fire to the tent! He was in no doubt as to the fate of his bad hand. He had seen enough frostbite in others to realise he was in serious trouble. He had to get to a hospital quickly. He loaded the smaller sledge with emergency provisions. and set out in great trepidation. 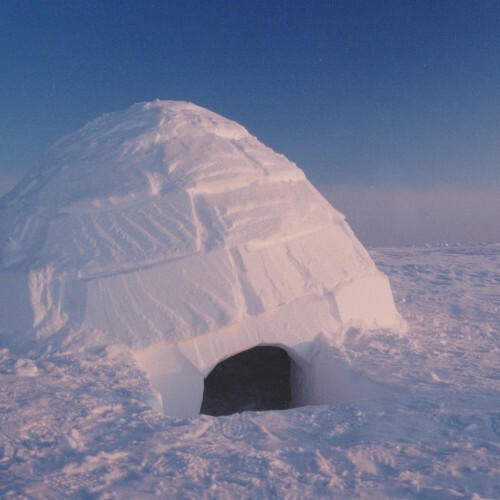 8 hours later he was back at the hut, erected his tent properly inside and called First Air at Resolute Bay who promised to evacuate him the following day. 36 hours later he was at Ottawa General Hospital watching as a surgeon stripped skin and sliced blisters from his fingers. Back in England he took penicillin for 4 months to keep gangrene out of the open cracks. By the end of June he was able to saw the dead finger-ends off his own hand with a fret-saw! 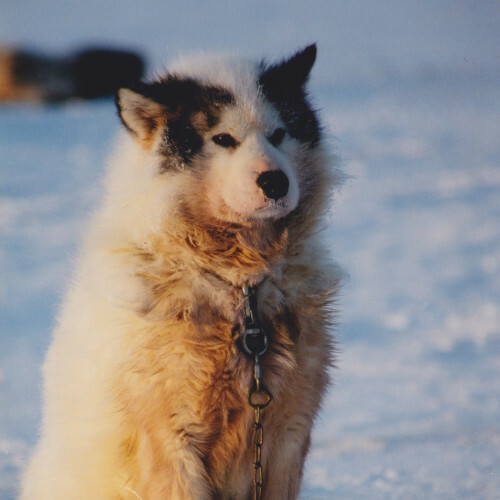 With over 26 years of polar travel, the frostbite odds were always narrowing and by bad luck this time they had caught up with him.